Pray for International Missions for the work of missionaries who take the gospel to people in cities and extreme places. At this time of the year, we reflect on giving to the Lottie Moon Christmas Offering® that supports them. 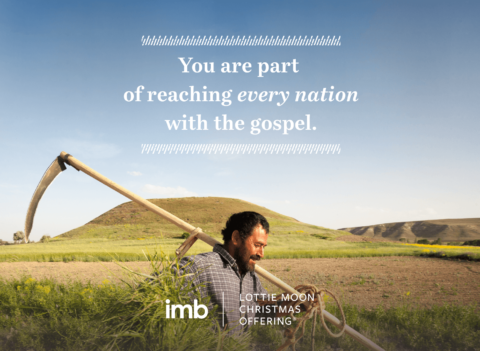 Starting in 1888, the Lottie Moon Christmas offering was established to empower the international missions efforts for Southern Baptist. After more than a century, the annual offering continues its steady growth. The national goal this year is $160 million. Your giving enables missionaries to be sent to make disciples and multiply churches among unreached peoples and places for the glory of God. 100% of gifts to this offering fund International Mission Board missionaries. Beachside Baptist Church has adopted a goal of $2,500 for the Lottie Moon Christmas Offering for International Missions. We will receive donations through December 31. Pray about the part God would have you take in this annual missions offering. Envelopes are in the racks on the pew backs for you to be able to contribute, or you may use the online donation form below. From refugee camps, urban neighborhoods, and remote villages, missionaries thank you, their churches, and share the many ways Lottie Moon Christmas Offering® funds touch the lives of the lost around the world.